At Forensic Analytical Consulting Services (FACS), our passion is protecting the health of people, families, communities and the environment through assessment, education and prevention. As such, we hope you find the following information and resources beneficial. What is smoke composed of? Wildfire smoke is made up of a complex mixture of gases, vapors and fine particles (i.e., soot) produced when wood and other organic matter burn. Among the substances found are gases from partially burned hydrocarbons (e.g., carbon monoxide) and potentially toxic or irritant volatile organic compounds (e.g., acrolein, formaldehyde). Char is a partially burned piece of material that can be identified by morphology, color, relative opacity, fracture pattern, structure, and other characteristics. Ash is the leftover residue following complete combustion. Soot is a black carbonaceous substance produced during incomplete combustion. How and when should my home be cleaned? The level of cleaning is dependent on the level of impact. However, in general, the first steps usually involve purging the space with outdoor air by opening doors, windows, and outdoor air intakes (only if air quality is identified as moderate to good). 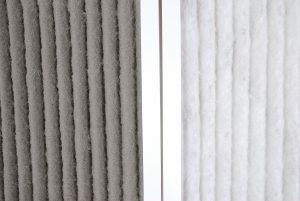 Air filters should be replaced and the ventilation system allowed to run. Cleaning of hard surfaces and porous items is recommended (e.g., wiping, HEPA vacuuming, scrubbing, carpet cleaning, laundering) when visible fire and smoke related particulate and odors are present. A professional restoration contractor may be of assistance in this regard. Frequent cleaning and increased efforts to improve indoor air quality may be needed for some time following a wildfire. Except for extreme cases where there are significant amounts of visible debris present in systems, cleaning of ductwork is not advised. Odors are best addressed through cleaning or disposal of contaminated material. Products that purport to “eliminate” odors frequently only mask one odor with another, and in doing so contribute additional chemicals to the indoor air. The use of ozone to eliminate odors in buildings is rarely recommended. Ozone masks odors by deadening the sense of smell, can damage building materials, and can react with other compounds to produce toxic byproducts. The Environmental Protection Agency has a document, “Ozone Generators that are Sold as Air Cleaners: An Assessment of Effectiveness and Health Consequences” that provides additional information on ozone . Occupants returning to buildings or fire damaged areas are likely to notice odors and experience health symptoms from contaminants in the outdoor environment. This frequently leads to increased concerns about indoor air quality in general, even to agents not associated with fires. Prompt and competent responses to these concerns can frequently prevent them from growing into widespread issues or claims. We are standing by to provide our services as needed or to simply answer your questions.